Imagine keeping all the Coursewhere features you know and love but moving to a new and improved version. I wanted to let you know what Solutionwhere has been up to. Over the past several years we've been working on Wisdomwhere, a totally redesigned version of our cloud-based registration software. This new Wisdomwhere is not just a redesign, but a whole new product — one that helps you solve the same old registration problems, but in simpler and more modern ways. It behaves differently. It has new features. It's been redesigned and rebuilt from the ground up so you can get improvements faster than ever before. Our mission is to help education professionals and their teams and Wisdomwhere helps us do that. How much better is the new Wisdomwhere? Customers reported it was easier to use and more intuitive. As for enhanced customization, we designed this from the start to allow for a high degree of customization. Features are turned off or on with a quick setting change. 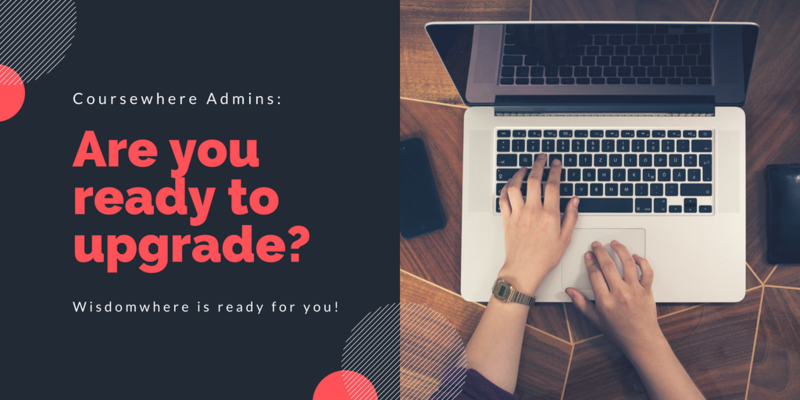 Why Upgrade Your Professional Development Management System? I want you to know we recognize that change is hard and that some of you may be saying to yourselves, “I love Coursewhere — why go build a new one?” At this point in the letter, I hope it's clear. For those who have concerns, I want to assure you that you won't be forced to switch to this new product, but we believe in time you will want to, and when you do, you'll never look back. If you are a current Coursewhere customer and are interested in a demo of the new Wisdomwhere, please let us know. Thank you for your openness to exploring something new with us in the months and years to come. We’re excited to take the next steps towards building a better product and we’re honored to have your support as we do. Will the current version of Coursewhere still be supported? Yes. At this time, we continue to support Coursewhere. No. Your current annual service charge will be the same in Wisdomwhere. Over time, we may add features that can be added a la carte. It would be your choice to pay more to use some of those new capabilities based on the value they bring. That will be your decision at that time. We are excited to do more for you. Why did you build Wisdomwhere? We have a vision for simplifying your work with software that’s easier to use, that’s updated continuously and faster, and is better suited to how you work with your registrants and your teams. A product that’s easier to use and evolves faster. Yes. While our aim is to build a simpler product that is easier to use — and therefore we anticipate less need for training — there will be training resources plus you will be able to phone or email our Support staff and get the help you need. We are here to serve you, and we take great pride in delivering quality service to you and your teams.